The big highlight of the week for Carrera, at first, came on Wednesday when he was elected to the IL All-Star team -- his first such honor since 2009 -- ahead of the Triple-A All-Star Game on July 16. Then, the left-handed-hitting outfielder went 4-for-5 with a homer, a double, three RBIs and three runs scored Sunday to seal this other honor. It was his second four-hit game of the season and bumped his overall slash line up to .316/.407/.432. With four steals during the week, he also pushed his IL-leading total in the category up to 36. It's been a yo-yo-type of season for the 22-year-old shortstop, who batted .225 in 25 games in the Majors before being sent back down to Triple-A in late June, but it certainly seems like his production is on the way back up. In 12 games since rejoining the 51s, he is 19-for-51 (.373) with 10 extra-base hits and 20 RBIs. He closed out last week with homers in five straight games and had six long balls total during that stretch. "When he first got back from the bigs, he struggled a lot in his first two games," Las Vegas manager Wally Backman told MiLB.com. "To come back was a good thing, for his age. He needed to get at-bats so that he could develop. They did the right thing to send him back for the development part." The week for the 28-year-old outfielder started with a bang. Well, two bangs. He went deep twice last Monday at Binghamton for his first multi-homer game since Aug. 10, 2013. It was the first of four multi-hit performances for Rodriguez, who has made a huge turnaround since batting .253 with only two homers in April. Following this latest run, his slash line is up to .316/.361/.552 with 14 homers and 42 RBIs. He leads the league with 26 doubles and ranks fourth with a .913 OPS. Given those stats, it's no surprise he was named to the Eastern Division team on Monday for the Eastern League All-Star Game. The Braves' No. 10 prospect is without a doubt enjoying his best professional season at the plate, as evidenced by his performance last week. He's collected at least two hits in four of his last five games, including a 3-for-4 game with two doubles, a triple and three RBIs on Wednesday against Huntsville. After batting .341 in both May and June, Kubitza has carried that momentum into July and now leads active Southern Leaguers with a .408 OBP and ranks fourth with an .895 OPS. Each of those would be full-season career highs if he maintains that pace. 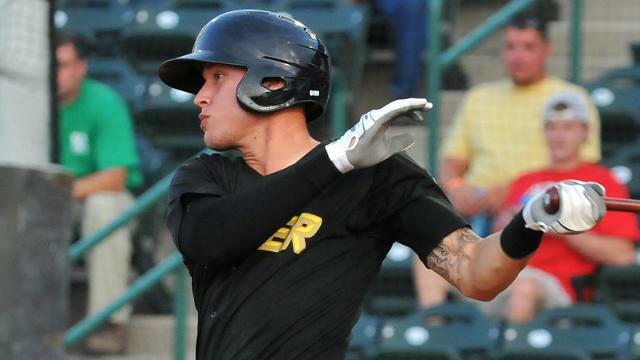 Taken by the Astros in the fifth round of the 2013 Draft, Kemp bashed and ran his way to Double-A ball in his first full season after putting up a .336/.433/.468 line with 28 stolen bases and a 45-to-35 K-to-BB ratio at Class A Advanced Lancaster. The former Vanderbilt second baseman hit the ground running at Corpus Christi, displaying the same patience at the plate and speed on the basepaths. Following last week's performance, he is 18-for-45 (.400) with a homer, three doubles, two triples, six RBIs and three stolen bases (all three coming over this past weekend) in 11 games since joining the Hooks. He's also walked seven times and struck out six times in that span. Buckley was last named a Player of the Week in August 2012 with Class A Dayton, and it's been a long road back to the honor. He played only six games for Bakersfield last season due to an elbow injury that eventually required Tommy John surgery to repair. He played 24 games for Dayton at the start of the season, sat out a month, returned to the Blaze in late June and has been on fire ever since. The right-handed slugger, who has played exclusively as a DH this season, homered in three straight games from Wednesday to Friday and collected all 12 of his RBIs in his first four games of the week. His line stands at .421/.443/.719 with four homers and 18 RBIs in 14 games since coming back to the Cal League. A 5-for-6 night with five RBIs is certainly notable. If it includes a cycle, you deserve some sort of award -- like this one, for instance. Yastrzemski made a big enough name for himself in his full-season debut with Class A Delmarva, where he was a South Atlantic League All-Star with a .306/.365/.554 line with 10 homers, 10 triples, 14 doubles, 44 RBIs and 12 steals in 63 games, and he has shown he's capable of doing just as well despite the move up to the Carolina League, where he owns a .333/.394/.483 line with a homer, a triple, four doubles and 13 RBIs in 16 games following the promotion. To some, Leonard might just be the answer to a trivia question that asks, "Who besides Wil Myers, Jake Odorizzi and Mike Montgomery was traded to the Rays in the James Shields deal?" But Leonard is playing like more than just a throw-in during his second season in the Tampa Bay system. He reached base at least once in each of his seven games last week and did so multiple times in six of those contests. Since June 2, he owns a .414 OBP, and he ranks third in the FSL with an .895 OPS on the season. Entering July, the 20-year-old first baseman hadn't hit more than four homers in any of the season's first three months. Five games in and he's already got three in July, including two that came Saturday at South Bend. He's batting .246 with 13 homers, 42 RBIs and a .782 OPS in 80 games with the Captains, and that represents a marked improvement from 2013, when he owned a .194 average with one homer, 13 RBIs and just a .561 OPS in 47 games before being sent to Class A Short Season Mahoning Valley. As a first baseman, the Indians will need to see those power numbers continue to climb from their 2012 15th-round pick. Jones was seen as a toolsy player when the Pirates got him in the third round out of LSU last year, but the one that has been on the biggest display lately has been, if you'll excuse the pun, the Power. He went deep five times last week, more than anyone else in the Minors outside Flores, including a two-homer show Sunday at Greensboro. After batting .231 in June, the 22-year-old shortstop is batting an even .500 over his first six games in July, bumping his season average up to .284 -- its highest level since May 12. Davis had a .338/.419/.523 slash line with six homers and 43 RBIs in 58 games as a junior for Cal State Fullerton, and since being drafted in the third round by the Astros, he's putting up similar numbers at Tri-City, despite the better competition and lack of a metal bat in his hand. He capped a stellar week by homering, doubling and driving in five runs Sunday to help the ValleyCats sweep Lowell. Through his first 22 professional games, the third baseman has a .284/.398/.519 line with four homers and 18 RBIs (third-most in the NYPL). "I categorize myself as a power hitter that has a knack for getting hits. In college, I always had a high average," Davis told MiLB.com Sunday. "I don't go up there trying to hit home runs or hit doubles -- they just happen on its own if you just stay within yourself." "We like his bat," Rangers scouting director Kip Fagg said after Texas took Trevino in the sixth round this year out of Oral Roberts. "We have scouted him since high school and there is power in the bat." He lived up to the billing last week, homering in the second game of a doubleheader Monday and then going deep twice Friday for his first career multi-homer game. His five homers in 22 games place him second in the Northwest League as does his .615 slugging percentage while his .983 OPS ranks third. When a batter is coming off a final collegiate season where he put up a .321 average, you hope he can just match that when he makes his professional debut in your organization. Grayson, a Cardinals 21st-round pick out of the University of Houston, is going beyond that with Johnson City. The left-handed first baseman had five multi-hit games last week and is third in the Applachian League in the early going with a .404 average through 15 games. O'Hearn, the Royals' eighth-round pick out of Sam Houston State, went 5-for-5 in his professional debut last month, and surprisingly enough, hasn't done much to come back down to Earth. He had multiple hits in five of the six games he played last week with the biggest performance of the stretch coming Thursday when he went 4-for-4 with a homer and two RBIs. With numbers like that, it's not too surprising to see that O'Hearn leads the Pioneer League with a .448 average, .707 slugging percentage and 1.199 OPS.